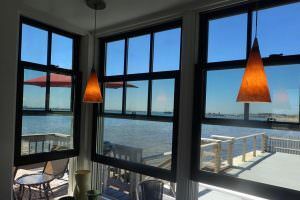 481 Commercial Street #2 is a one of a kind waterfront living experience. 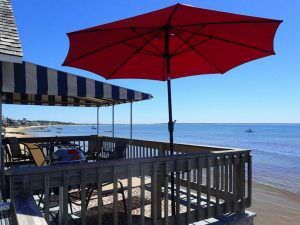 It has one bedroom and one bath and is located on the water in the East End of town. It has 487 square feet and is being marketed for $899K. 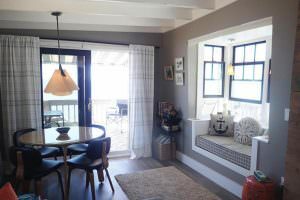 The Boathouse at the Chandler House Condominiums is one the most sought-after waterfront cottages in Provincetown. This one-of-a-kind property sits on the water and has sensational views on three sides that offer an extraordinary beachfront experience. 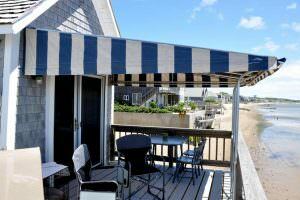 The private deck provides the some of the best views of the bay, beach and the Provincetown waterfront. The Gallery District is right outside your door as well as some of the best restaurants in town. 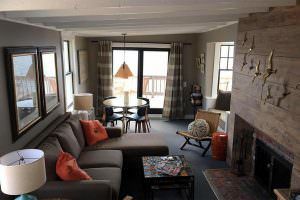 The living area is wide open to the deck, lovely for year-round use and has a cozy window seat overlooking the water. There is a fireplace with a warm barn-board surround. The fully equipped kitchen has a breakfast bar with a glorious view out to the east. The bedroom has vaulted ceilings and a barn-door slider for privacy. The renovated bathroom has granite countertops with custom tiling. There is common laundry area and parking for one car. The Boathouse has one of the highest rental incomes in the complex – which itself is one of the top rental destinations in town – that generated a gross rental income of $58K in 2017. Please call if you would like to know more about this exceptional property.